Excellent elasticity & Bosch quality. Handy storage kit for all hand tools and bits, Comes in a compact suitcase for easy carriage and handling. Precision bits for mobiles and laptops, screwdriver bit for all household work. Allen Key for all maintenance work, hammer and electrical tester is must have for your home..
Bosch 108 Pieces All-in-One Metal Hand Tool Kit, 2607002790 is a premium quality Professional Kits from Bosch. Moglix is a well-known ecommerce platform for qualitative range of Professional Kits. All Bosch 108 Pieces All-in-One Metal Hand Tool Kit, 2607002790 are manufactured by using quality assured material and advanced techniques, which make them up to the standard in this highly challenging field. The materials utilized to manufacture Bosch 108 Pieces All-in-One Metal Hand Tool Kit, 2607002790, are sourced from the most reliable and official Professional Kits vendors, chosen after performing detailed market surveys. Thus, Bosch products are widely acknowledged in the market for their high quality. 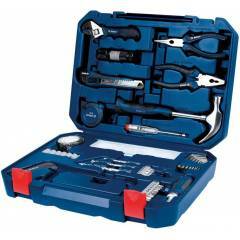 We are dedicatedly involved in providing an excellent quality array of Bosch Professional Kits.